We all do stupid things at times and I recently did mine. My wife and I had to take a trip to Utah to see one of our children. Because our car is on the small size and we were taking quite a bit of stuff for them, I had to make some extra room in the car. So I set aside a few things that I normally carry, including a set of jumper cables. You guessed it; I had a dead battery on the trip and no jumper cables. Fortunately, I was able to get help and got started without any problem. A new battery and a set of jumper cables later my problem is solved. But it goes to show you always need to be careful. 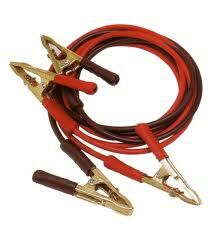 If you don’t have a set of jumper cables and know how to use them, get a set and learn to use them now. My mistake was harmless, it just cost us a little time, but in a real emergency it could have been fatal. You can have a year’s supply of beans and rice; enough ammo and weapons to fight off the Golden Horde, a gaggle of zombies and a few renegade cannibals; acres of seeds and enough bandages to turn the entire NFL into mummies, but if you don’t have the prepared mindset, you will still struggle to survive. What is a prepared mind? It’s a way of thinking. It’s a different philosophy of life than that of most of the population of North America. Someone who is mentally prepared processes everything differently: threats, challenges, and windfalls. There are many common factors to this philosophical viewpoint but here are the ones that are the most important. 1. A prepared mind reacts to a threat by taking action. In my self defense class, I learned that there are two types of people: victims and victors. A victim will curl up in a defensive position, perhaps sob, or even freeze in terror. A victor, however, will react to the threat, even if she knows that she is outweighed, outgunned or outnumbered. A victor does not give up. A victor may choose not to fight at a particular moment because it is not the best opportunity, but she will watch for an opening and she will recognize it and be ready when it comes. A victor knows when to stand and fight and when to run to fight another day. Even a victor can be afraid, but fear does not rule her – she rules her fear. 2. A prepared mind is situationally aware. A preparedness mindset makes one ever aware of what is going on around him. If an unusual vehicle is present, he takes note of it. He knows what is normal in his surroundings and is quick to notice when something is different. When he is in an unfamiliar place, he is actively observing, looking for potential threats and taking mental photographs which can be retrieved if he needs to elude danger or defend himself. 3. A prepared mind considers privacy a way of life. Privacy is more than just OPSEC; it’s a way of life. A prepared individual carefully guards her internet privacy, by controlling settings on social media, taking care to avoid posting information that could aid a criminal in locating her, keeping a low profile by not posting attention-getting pictures, and using non-identifying usernames in forums. She doesn’t share stories about prepping with friends, family and neighbours, unless they have been carefully vetted and are included in plans for the future, should the need arise. Even with those she shares information with, there are things that remain secret, such has hiding places, survival caches, and the amount of supplies that she possesses. She teaches her children to be likewise circumspect regarding family supplies and preparations. 4. A prepared mind has a back-up plan to the back-up plan. There is never JUST Plan A. There is also Plan B and Plan C, at the very least. A prepared person has multiple evacuation routes and methods. He has a bug out bag in more than one location. He doesn’t have all of his supplies in one place, but in two or three, or even more, locations. Every member of his family knows what to do in the event of an emergency, even if they are geographically apart from the other family members. He attempts to think of things that could foil his plans and then figures out how to deal with the issues before they arise. 5. A prepared mind takes all possible precautions in order to avoid trouble. A person who is prepared is not looking for trouble; she is actively trying to avoid it. She locks the door to her house, even if she is only stepping out for a moment or if she is at home. She keeps her car locked and checks the backseat before she gets in. She parks near the exit when going to a crowded place. She maintains awareness of those around her in order to recognize a threat. She carries multiple items that can be used for self defense, based on the laws in her area. She makes her home uninviting to criminals by posting warning signs about her dog and her alarm system. She avoids dangerous situations, like walking down a dark deserted alley in a bad neighborhood in the middle of the night, whenever possible. 6. A prepared mind has a problem-solving attitude. Someone who is prepared is not hopelessly dismayed when something goes wrong. He actively works to prepare broken items using the things he has on hand. He attacks a problem from different angles until he solves it. He doesn’t throw in the towel, but when met with undesirable results, tries something different. He repairs instead of replaces, he substitutes one ingredient when he is out of another, and he figures out how to resolve issues instead of throwing his hands in the air and giving up. Some might even call him “stubborn”. 7. A prepared mind is flexible. When things turn out differently than expected or planned, a prepared individual does not get rattled. She merely takes another look at the situation and makes another plan. She recognizes when it is time to change directions and go about things differently, and seizes the opportunity to do so immediately, without wasting precious time attempting to stick to a plan that clearly will not work. 8. A prepared mind seeks versatility and simplicity. Once you’ve changed your personal philosophy, you will notice how your new way of thinking affects your everyday, non-crisis life. Your independent thinking will allow you to succeed in the workplace and at home. You will be alert and ever-ready to protect yourself, and you will avoid danger and mishap by merely being prepared for it, should it come your way. That kind of confidence is a major deterrent. The first, and most vital, element of preparedness is the brain. Once you have your mind in the right place, the rest is easy. Do You Have the Survivalist Attitude? In some other posts we’ve discussed good survivor traits such as compassion, adaptability and your ability to perceive risk. Today I’d like to talk about a trait we call ‘healthy skepticism’. According to the dictionary, the definition of skepticism is: an attitude of doubt or the doctrine that true knowledge or knowledge in a particular area is uncertain. Having an attitude of doubt is a good trait to have as a survivor. If something doesn’t seem ‘right’ to you, your ‘doubt’ will make you question what’s going on. We call the skepticism ‘healthy’ because even though you may be doubting something, once you question things, you may discover different ‘truths’, allowing you to make better and logical decisions. If your skepticism trait isn’t healthy, you could be entering ‘paranoia’. That would be going a bit too far..
Everyone should be a good skeptic. Never assume that what you hear from ‘authority’ sources like the news media, big corporate, or the government, is always true. Do your own further research, then make a decision. Don’t assume that you’re getting what you think you’re getting. Here’s a great example. Last night when we were watching FOX news, they reported on something that absolutely got me mad! Apparently there is a pretty high percentage of ‘seafood fraud’ going on in America to take advantage of common consumers. Actual DNA tests were done in 74 restaurants. The widespread fraud was found to be 55% in Los Angeles and 48% in Boston. What is the fraud, you might ask? One species of fish (a cheaper species) is being substituted for a more expensive fish. So, they are charging consumers for the more expensive fish and giving them the inexpensive fish! Some of these restaurants and grocery stores may not even realize the problem. Even being highly educated on different species of fish, you might not be able to tell the difference between two fillets just by looking at them. The DNA testing has proven that there is a legitimate problem. In the restaurants, sushi bars and grocery stores that were sampled, 50% of the seafood that was sampled was not the seafood it was labeled to be per the DNA testing results. In the FOX news video, side by side examples of some fish fillets were shown. The examples looked very similar. How would the uneducated consumer know if they got what they were paying for? Side by side an inexpensive tilapia fillet looks a lot like a snapper fillet. An Asian catfish fillet looks like Dover Sole. And steel-head trout looks like salmon. A flounder filet looks like a Halibut filet. Are you getting what you’re paying for? The report indicated that this seafood fraud doesn’t start with the fisherman, but that somewhere in the processing, distribution, or end market, someone is seeing the profit. I’m sure there are many more areas where we the consumer are getting ripped off because we assume that what we are being told is true. Let’s all remember what happens when we ‘assume’. Keep a healthy skepticism. Ask questions. Don’t assume. Be vigilant. Don’t be Sheeple. Think for yourself. It’s part of modern survival. During times of universal deceit, truth becomes a revolutionary act. Your Community: A Survival Help Or Hindrance? Ok, so this picture is pretty old-school with more diabetics using pens and pumps now-a-days, but the morale to the story is the same. What do you do if you are dependent on drugs that must stay in a cool dry place and you’re faced with a power-grid down situation long term? I remember Hurricane Hugo. I was living in Charlotte, NC and the storm barreled up through South Carolina and hit Charlotte, NC as a Cat 1 storm. No one was prepared for that! That was 1989. I was diagnosed in 1987 with Type 1 diabetes (insulin dependent or some refer to it as juvenile diabetes) and all of a sudden, I was without refrigeration for my medication. In my own opinion, at times, I believe the recommendations are a little over exaggerated but I do believe in trying to stay within the recommendations for any med’s that need to stay refrigerated. They may still work, if you don’t follow the recommendations, but they may not work as effectively. Effectively is the keyword. So, I found this video by The Patriot Nurse and she has a great idea for any refrigerated med’s you may have to keep cool and dry in a long term situation. I don’t agree that the hole must be 4′ – 5′ deep – that seems a little extreme but I can see a hole being a couple of feet deep. I do like her choice of container and the importance of keeping the box and insert with the medication. I would add – write the expiration date on the outside of the box and be sure you have a list with you (somewhere) showing the expiration date of med’s you buried! Also, cleverly mark where you buried your meds! What good is buried med’s if you can’t find them! Let me know your thoughts! Comments are always welcome! There should always be good variety in your long term food storage. If your long term food storage is not done properly, you could find yourself suffering from a very real threat to your survival. Basic long term food storage must be done in an efficient manner in order to avoid the very real danger of appetite fatigue. Appetite fatigue occurs when there is plenty of food available but there is a lack of variety in your diet. This is the old “mind over matter” dilemma. Your mind will eventually tell your body that it is not going to eat the same thing again. As a result, you may find yourself losing your appetite. This will cause you to start eating less, even when there may be adequate food supplies present for your consumption. This could ultimately endanger your ability to survive. This is where the hidden danger lies. Even though you may have adequate long term food storage, you will need to have a variety of food items to avoid the problems associated with appetite fatigue. While basic food staples are good to have on hand, you will need to incorporate various other food items into the planning associated with your long term food storage needs. A combination of food storage items that includes different spices and seasonings, flavorings, and sauce packets can help to avoid the problems caused by appetite fatigue. You would do well to also stock both canned and dehydrated food items that will give you a greater variety and more choices in your diet. If you have decent gardening skills, you could also plan to supplement your food storage with fresh vegetables and herbs from a garden. Appetite fatigue could also be called the “left-over syndrome”. How many times have you eaten more than one meal as a result of left-overs? How many times have you thrown food away simply because your family simply refuses to eat the same thing again? It simply goes bad because everyone refuses to eat it again because they want something different. Variety is the spice of life. If you fail to maintain some variety in your food storage program, you may risk the development of appetite fatigue. We all know why I’m dealing with a bit of sleep deprivation. (Baby is doing really great, by the way.) In an emergency situation, there are all sorts of things that could cause some sleepless nights. Stress could cause insomnia, perhaps guard duty has you out of your sleep sack for a few hours every night. The point is, you have to keep going, here are some tricks to aid you in fighting the sleepy-fog. Your brain is working less efficiently – Research shows that our brain’s ability to function quickly deteriorates when we are sleep deprived. Make sure you give yourself longer to do tasks that require thought. You’re more likely to make mistakes remembering measurements, complicated orders, solving problems or recalling something previously memorized. Your reaction time is longer – Go slower if you’re driving or riding a bike, as you’ll be slower reacting to obstacles. Don’t go hand-to-hand with someone well rested if you can avoid it. Eat more calories – I have always heard this in jobs where crazy-long shifts can happen, when you can’t give your body restorative hours of sleep, give it as many calories as you can. Now, this is within reason of course, and works best if the calories are healthy and energy dense. A large bag of potato chips isn’t going to replace an hour of sleep, but an extra half portion of whole wheat pasta can make a big difference. Watch for mood swings – Sleep deprived people feel exhausted and fatigued, which affects their moods, causing depression, stress and anger. Take steps to minimize stress and anger, through communication strategies and meditation. Try not to make important decisions during your time of sleep deprivation. Drink more water – Expelling waste is another function that gets taken care of during sleep. If you can keep hydrated, you can help your body deal with the excess toxins that might be present because of your sleepy state. Using Caffeine – Use caffeine in moderation if you can. A little bit will help counteract the drowsiness of sleep deprivation. But, too much used too often will see a decrease in performance as your body becomes used to the level. It can also cause jitters or shakes, which could be detrimental to your shooting accuracy. Nap if you can – A 20 minute nap will do some good. You’ll feel more refreshed and alert. Sleep when you can, but don’t use “downers” to get there, you’ll be setting yourself up for trouble. May all your nights be restful, but if they’re not, at least you should know how to deal with it. I started a series a posts a while ago about building a survival computer. Technology has progressed to the point now that you do not have to build your own — you can buy it in a big box store. The rise of the tablet computer in the last three years has been nothing short of meteoric. The tablets available today have enough processor power and RAM to replace most people’s everyday computer. Today’s post is going to go over the pros and cons of using a tablet for TEOTWAWKI. The first question in relation to tablets is “What OS to buy?” There are two choices iOS (Apple) and Droid (Google). Yes, there are Windows 7 (and soon Windows tablets available, but all the ones I have tested are crap. Don’t waste your time or money. I recently bought a Droid Tablet, but quite a few of my friends have iPads. For me, Droid is the only option for one key reason: Apple locks down their hardware, and limits consumer choice as a corporate-wide mantra. There isn’t one iPad that has a built-in SD card reader, or USB port. Sure, there are add-on accessories you can buy, but I see the single – hardware platform as a significant flaw. The major flaw with the Droid OS is Google tracks everything you do. I’m sure Apple does as well, but they are sneakier about it. I’m pretty careful of what sites I go to on the tablet, but who knows what Google’s algorithm knows about me already? The next question gets a bit tricky. Unlike apple with only one factory making them, Droid tablets are made by hundreds of different manufacturers, which leads to chaos in the tablet market. I spent weeks researching before I bought my tablet, and until I had it in my hands and played around with it I was unsure I made the right choice. I bought an Asus EEE Transformer Prime. the “Prime” is important, because that is the second generation of tablets – the second Gen tablets have a 201 model number. There are differences in the screen and size so a screen protector or case designed for the Asus Transformer does not fit the Asus Transformer Prime. The next decision point was the size. The Droid marketplace has tablets that range in size from 7 to 10 inches. The main use of my tablet is as an information portal, where I can keep the hundreds of manuals and documents, whitepapers, etc. I need on a day-today basis for my job in one place. I went with the 10″ screen, and the screen on my tablet is just as good as the new iPad’s (for ~$100+ less). The 7″ tablet format is getting very inexpensive. Google is releasing a 7″ tablet soon for about $200. Soon is relative, could be this summer or for the Christmas rush. If you are on a budget, this is the best place to shop. Asus is releasing a third generation transformer (301 series) soon, with a 7″ screen. I could not possibly review even a small percentage of the available tablets out there in the marketplace, so I will share what I was looking for, and how the tablet I chose stacks up. The biggest flaw with the Droid marketplace is many of the tablets cannot be updated to the latest version of the Droid OS (4.1 “Ice Cream Sandwich”) Like with cell phones, those people making the Droid tablets want you to toss the tablet and buy a new one instead of porting the new version of the OS to their old hardware platform. Generally, this is not that big of a deal, as the old versions of the Droid OS work just fine with even new applications, but there are exceptions. The “killer app” for the Asus Transformer series is a clip-on keyboard that acts as a case. This docking station adds battery life, a full-size USB port, and a decent keyboard with touch pad. It’s an additional $150, and I have not bought it yet. I’m being frugal and trying to find a coupon online to save some cash. I don’t need the keyboard yet, so I’m not in a rush. Regardless of which tablet you buy, you should buy a case and a screen protection film. Amazon.com’s reviews are an excellent source of information to help make your choice. I’m going to buy a stylus at some point and see if I can take notes with it directly, rather than using the touch keyboard. Death to paper! I’m real new to Droid, so I don’t have any specific applications to recommend yet. In a future post I will go over what apps I have installed and which ones I liked the most. For now, I’ll list what I want to get out of the tablet. A lot of this software comes installed already, and a lot more of it is free. I have learned that in Droid you need to have an application that can kill other applications. Like windows, even when the application is closed, it isn’t always unloaded from RAM. I’ve recently learned that the built-in movie player cannot play H.264 encoded media files… which is a drag because I wanted to convert my media to that format. I’ll share what information I find. Over time I will be adding additional functionality as I find it. Perhaps a gardening application to help me plot and track a small garden. I might switch workout tracking applications, and the tablet is a lot easier to work with than the tiny iPhone. Today’s tablets can do 99% of what your PC can do. They are light, extremely power-efficient, and relatively inexpensive. If I just needed a pc to check e-mail, browse the internet, watch netflix, and basic word processing and spreadsheets — then a tablet could do all of that. I am a power-user of technology. I game with my PC, build virtual labs for testing and learning, and use Sketchup for designing woodworking and other projects. So a tablet cannot replace all of my needs, but it can do most of them. For example, I n0 longer print out documents for woodworking, I snap .jpg’s of them and load them onto the tablet for easy reference. Saves toner, and Sketchup is notoriously hard to print from. They currently do not have a model viewer to open my projects natively, but I hope they do have one soon. Just like any computer system, you need to do regular backups. Every vendor is different, but there are a few vendor-agnostic applications out there to help you backup a perfect image of your tablet. Most applications share data with “the cloud” but it is always preferable to have a backup you can put your hands on. When testing applications, I would suggest testing them without any WiFi or 3G networking available. This is to help ensure that if you are without Internet access for an extended period, oh let’s say TEOTWAWKI, that your applications continue to function. Most free applications require network access to download new advertisements, and disable themselves without network access. Even if you are not in a full-blown collapse of civilization, say your stuck in Buffalo, NY when an ice storm strands you at the airport and a snowplow takes out the internet link… 30+ hours of boredom awaits if you cannot fill at least some of the time with solitaire, Scrabble, etc. Finally, I want to mention that the Droid platform can be hacked, or “Rooted” allowing you increased access and functionality for your tablet. This almost certainly voids your warranty, but I wanted to mention this out of completeness. When you root your tablet, you can load different versions of the Droid OS, perhaps allowing you to upgrade your tablet to the latest version, when your manufacturer doesn’t release that update for your tablet. I would recommend against it, unless you really know what you are doing. survive. Is it so wrong to want to live?" but Good Heavens, man, your plane only went down yesterday!" In honor of our Powerless Cooking class tonight I wanted to share a recipe with you I tried this weekend that required no power to make. If you’ve followed our blog for long, you know that Jodi is the one that likes recipes, and I flat out get anxiety when someone asks me how I made something. I rarely measure, or write things down, and don’t KNOW the actual recipe. This kind of cooking style, is what I blame for my dislike of baking. Baking cookies and desserts are the type of thing you actually NEED to measure for – AND turn on the oven for. For some reason I’m ok making bread (maybe because I have the recipe memorized) but all other baking kind of irritates me. How’s that for a confession. Anyways, I found this recipe on Pinterest a few weeks ago. If you’re not already following us on Pinterest make sure you do – we post, and repost cool stuff!. It was for a healthy energy ball. The thing that really caught my attention were the words NO BAKE, and HEALTHY. Hmmm I thought, maybe I could try those one day. My kids love granola bars, I don’t love the ingredients that always come with them, or the price tag for the healthy ones. I figured it would be worth a try. Sunday night we were feeling an itch for a treat and I didn’t want to turn on the oven. I had about half the ingredients the recipe called for (I don’t always have cocunut or ground flax seed). I read the full post on the Smashed Peas and Carrots Blog, the recipe came from and decided substitutions would work just fine. I ended up with this mixture and JUST for you, I paid special attention to my measurements so I could share it. Not that I’ll ever actually measure when I make these again! Put all the ingredients in a bowl and mix. You then put the mixture in the fridge for 30 minutes to cool. If you’re going powerless, you can skip this, it will just make the mixture tougher to make balls out of. That’s when you just grab a spoon and eat the mixture right out of the bowl. After the mixture is cool, roll into balls. Store in an airtight container in the fridge – if they last that long. What I love about this recipe, is that it uses Food Storage, it has no refined sugar (outside of the chocolate chips), or butter, or baking, or REAL need for measuring. If it’s too sticky, add more dry stuff. If it’s too dry, add more honey. Substitute whatever you like. I think I’ll do raisins instead of chocolate chips next time, maybe craisins, chop some nuts… whatever you like. I think I’ll make these again for sure! Once again, I was replenishing a staple, salt in this case, and I started to crunch numbers in my head about how much salt I should consider storing for SHTF. I thought enough about it that it turned into a post. :-D Enjoy. Cooking with/Seasoning with – This part is easy. Even if I include baking in the figures, a couple of pounds of salt would see us through most of a year. Preserving meat - This one is trickier to figure, but then I thought, what if I assume I want to preserve a half a cow? That’s as good a place as any to start. That would be on average 200 pounds of dressed meat. And, if we remember our lessons from Chefbears post on Cuts of Meat not all of that will be suitable for preserving. Let’s keep the numbers even, this is back of the napkin level here, we’ll say that 150 pounds of it is fit for preserving. If we are using a curing mix that calls for 2 cups of salt per pound of beef, that’s 300 cups of salt. That’s good to know. Pickling veggies – I’m thinking here of things like kimchi, where you’ll need a cup of salt for a crock of fermenting cabbage. Or, even pickling cucumbers and dilly beans, those usually call for a tablespoon of salt per pint. Vegetable preservation could easily take a couple of pounds of salt to pickle a large crop. I think you’d find that after a couple of pounds of salt, jars and space will be your limiting factors, not stored salt. Barter -I think salt could be an interesting barter commodity too. If you bought it in the small pound containers from the grocery store, it’s around 44 cents, and already portioned out into a convenient amount. Keeping them away from water would be the hardest part. But, definitely worth a thought. Besides deciding all of the above, you’ll also want to decide how to split the weight of salt between Kosher salt, and Pickling salt and Iodized salt. Split it to match how your family eats salt. Spend the money to get it into water proof containers. How much salt would you store to get through a long SHTF event?